In December 2018, a coyote was found having a generalized (grand mal) seizure in the middle of a residential neighbourhood in Burlington, ON. The seizure started approximately 30 minutes prior to animal control and police arriving on the scene. As the coyote continued to seize and was foaming at the mouth, the police officer euthanized the coyote in order to alleviate the animal’s suffering and ensure public safety. 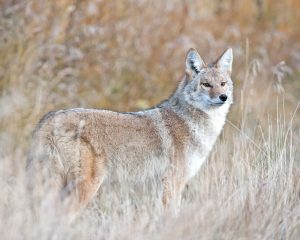 As the coyote had clear neurological disease, it was sent to the Ministry of Natural Resources and Forestry for rabies testing (dRIT), which was negative. After rabies infection was ruled out, the coyote was brought to us at the Canadian Wildlife Health Cooperative Ontario/Nunavut region for post-mortem examination. Aside from the trauma associated with euthanasia, the only finding on post-mortem examination was a blue-green material throughout the stomach and intestines. The colour of this material was highly suspicious for an ingested toxic agent and samples from the gastrointestinal tract were submitted for anticoagulant (rodenticide) screening and gas chromatography-mass spectrometry and liquid chromatography-mass spectrometry (GC/MS-LC/MS). There was no evidence of anticoagulants in the screen; however, LC/MS detected methomyl in the gastrointestinal tract material. Based on the amount of blue-green material in the gastrointestinal tract and the severe clinical signs noted, it is suspected this was a deliberate poisoning. Methomyl is a carbamate insecticide, which is a broad-spectrum agent used to kill insect pests and is commonly used as a fly bait. The sale of products containing methomyl is highly regulated in Ontario, but it is still used as a pesticide on certain crops and as a granular bait on farms. Methomyl is highly toxic to both mammals and birds and can be quickly absorbed through the skin, lungs, and gastrointestinal tract. In acute cases, methomyl will cause central nervous symptoms (predominantly seizures) and respiratory arrest. Methomyl has been misused to kill nuisance wildlife, such as raccoons, skunks, and coyotes, but it can also kill humans, dogs, cats, and other domestic or wild animals. The poisoning of wildlife in Ontario is strictly prohibited except for specific licensed poisons (pesticides) used in the removal of pests, such as mice and rats. If you suspect that your pet has been poisoned by carbamate insecticides, then you should contact your veterinarian immediately. If you are in Ontario and suspect someone is deliberately poisoning wildlife, then contact the Ontario Ministry of Natural Resources and Forestry (MNRF) 1-877-847-7667 (http://www.mnr.gov.on.ca/en/) or call Crime Stoppers anonymously at 1-800-222-TIPS (8477). Previous story Do rat control programs work to reduce public health risks?